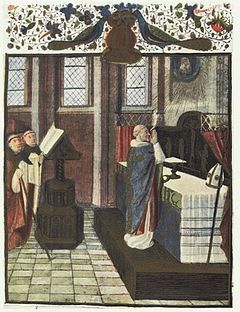 A Medieval Low Mass by a bishop. The term comes from the late-Latin word missa (dismissal), a word used in the concluding formula of Mass in Latin: "Ite, missa est" ("Go, it is the dismissal"). ↑ Missa here is a Late Latin substantive corresponding to the word missio in classical Latin (The Liturgy of the Mass in Catholic Encyclopedia). "In antiquity, missa simply meant 'dismissal'. However in Christian usage it gradually took on a deeper meaning. The word 'dismissal' has come to imply a 'mission'. These few words succinctly express the missionary nature of the Church" (Pope Benedict XVI, Sacramentum caritatis, 51). This page was last changed on 5 July 2018, at 17:08.